After a parabolic rise in Sydney home prices over the past cycle, mostly aided by a fear of missing out, property prices plateaued then rapidly moved lower midway through 2017, catching many by surprise. Sydney home prices have dropped 7.4% over the past year, according to CoreLogic’s latest Home Value Index, the sharpest annual percentage decline since February 1990. Cameron Kusher, a Research Analyst at CoreLogic, posted a series of charts on Twitter showing Australia’s largest and most expensive housing market has declined 8.2% from its cyclical peak 15 months ago, making this the fastest reversal in over three decades. 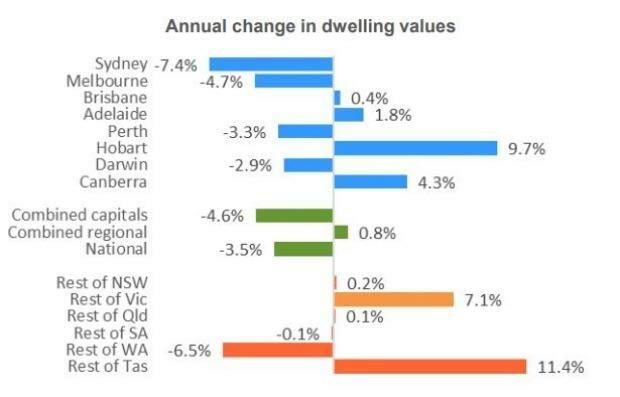 As shown in the next chart by Kusher on Twitter, in the past, it has taken several years for Sydney home prices to revert to prior cyclical peaks whenever values have plummeted. Following the ugly downturn in the early 1990s, it took five years for home prices to return to their prior nominal peaks. Many of the country's top economists forecasted home prices to increase in 2018; one forecaster even expected prices to jump 9%. However, this was not the case, as house prices have experienced their most significant and longest peak to trough decline in modern history - spurred by housing affordability constraints, tightening of lending standards, and the Australian Prudential Regulation Authority's restrictions on new investor loans. The Australian Financial Review surveyed five top economists that now expect the national house value index would continue to deteriorate into 2019, with Sydney, the epicenter of the downturn. 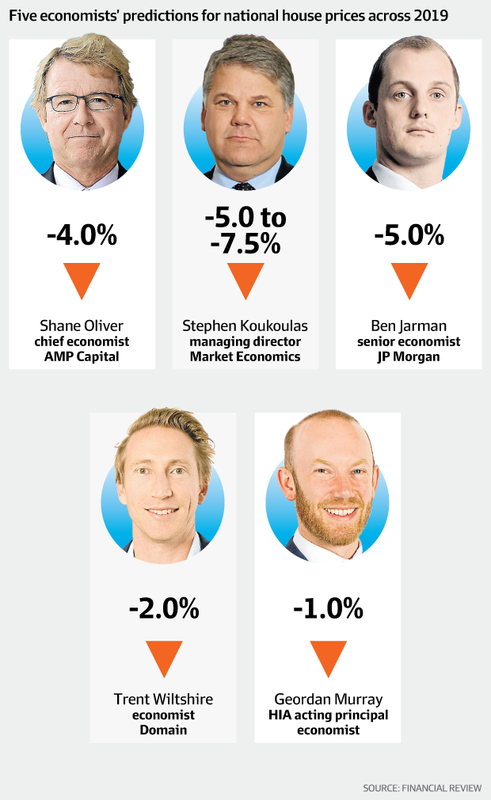 Stephen Koukoulas, of Market Economics, was the most downbeat of the bunch, with expectations prices would fall in Sydney between 7.5% and 10% in 2019 after a drop of 7.5% in 2018. "From the 3rd quarter in 2019, I am forecasting some stability in prices as supply and demand forces underpin new activity," Koukoulas told The Australian Financial Review. "From the 3rd quarter in 2019, I am forecasting some stability in prices as supply and demand forces underpin new activity," Koukoulas told The Australian Financial Review. Once a floor is found in prices, he then expects first-home buyers would enter the market and take advantage of increased levels of affordability. Most of the economists agreed that the downturn has mainly been driven by tighter lending standards, not an interest rate hike cycle seen in prior turning points, there is evidence this bear cycle could be the longest in history. The official policy rate of the Reserve Bank of Australia (RBA) has hovered at 1.50% since September 2016, which is at its lowest point on record, and some economists think the RBA could start hiking to get ahead of the next recession. An obvious negative for real estate markets. Also, recent tightening in mortgage lending standards has now mostly run its course, at least according to Australia’s banking regulator, it is unlikely that lending standards will be relaxed given Australia’s already-high household debt to income ratio, a tailwind for the real estate market that has now turned into a headwind. On top of everything mentioned above, an unprecedented supply of new housing is about to come online in Sydney, which will further tilt the supply side of the equation. It all points to a continuation of the Australian housing market crash, one that will surely go into the record books.